The 30 Miles of Freedom microsite delivered a fuel-efficiency message to the Millennial generation in the form of a social media driven contest. Using Google Maps technology, users could map their favorite drives – up to 30 Miles long – and illustrate them with photos and captions. Traffic to the microsite was boosted through endorsements by a band and bloggers with large social followings dominated by millennials. Entries were promoted on social media, driving more traffic. In phase 2, the best trips were recreated as video content, giving the site even more interactivity. Two new Jeep vehicles were awarded after users voted on the microsite. With only digital advertising support in market, both Patriot and Compass sold at completely unexpected levels. The toughest targets in today’s car market are Millennials – 20-30 year olds. Connecting with them at an early stage can mean the beginning of a lifelong (and lucrative) relationship for an automotive brand. Trouble is, traditional media just doesn’t work. They don’t watch TV and haven’t opened a newspaper this decade. ‘New’ media is where it’s at – they LOVE anything digital – especially social media like Twitter, Instagram and Facebook. Millenials ‘share’ everything. Where they’ve been, what they’ve eaten, and which celebrity they brushed shoulders with. Those ‘Experiences’ are the ‘currency’ they trade in. They’re not watchers – they’re doers who want to see, feel and experience everything. Our challenge was to use a fuel-efficiency message to create awareness for the Jeep Compass and Patriot vehicles among the Millennial generation. Our strategy was to connect with them using their own language – the sharing they do as a routine part of their lives. We positioned the Compass and Patriot as freedom machines – small, nimble SUVs with a can do/go anywhere attitude who both deliver an awesome 30 miles per gallon. Drive one of these and your social feed will be the envy of all your followers. 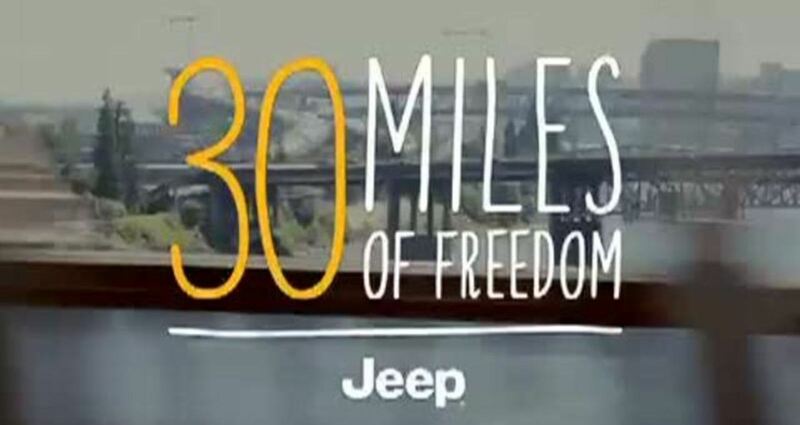 We created “30 Miles of Freedom” – a social media driven contest with winners taking home a new Jeep vehicle. SapientNitro built a highly sharable microsite allowing users to show off how much adventure they could pack into a single gallon of fuel. Using Google Maps technology, users mapped out their best 30 mile long road trips. Then they uploaded their favorite photographs to show off the sites and events that made that trip amazing. After personalizing and describing their trip to make it one-of-a-kind, they submitted it to jeep.com where it was displayed for the world to see. We enlisted the help of a hot, indy band – “Portugal, the Man” and some well-known bloggers to create more buzz in the social world. Users tweeted and posted about their trip to get more views and bring more traffic back to the 30 Miles of Freedom site. There, they found a visual scrapbook of amazing escapades, cool sites and big smiles all delivered by the Jeep Compass and Patriot. It brought freedom to life, showing users what driving a fuel-efficient Jeep vehicle could be like. In the next phase, we chose the top six journeys and recreated them with a professional video crew. Users saw actual entrants behind the wheel of what could be their future car. The videos were promoted via social media and then voted on by visitors to the homepage. Finally, we awarded two brand new Jeep vehicles and continued to showcase the adventure built into every one.